This past weekend I did something that I promised myself that I’d never tell anyone. It’s a secret that I’ve held for quite some time and one that kind of made me feel funny on occasion. For years and years I sat and listened to people talk about this, but I never experienced it for myself. In fact, it’s been 20 years since I first heard about this. A whole 20 years!!! I can’t believe it’s been since 1985. Saturday afternoon I was at home and I didn’t have anything to do, so I figured that I’d watch a movie. Now I have hundreds of DVD’s and most of them are old school movies or Blaxploitation joints. I do have an assortment of recent movies, but I tend not to buy movies that have been released within the past 5 years. I looked on the shelf of my entertainment center and saw the DVD case of a movie that I knew I had to see. This movie was one that I just had never taken the time to sit down and watch. It was The Color Purple. I saw it. 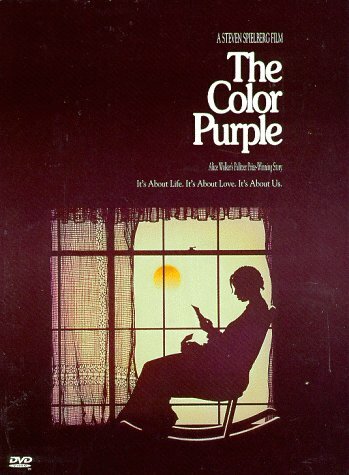 I saw The Color Purple!!! 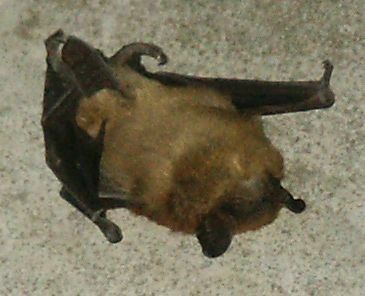 So I go out onto my balcony to get a breath of fresh air and what do I see… a bat. My first thought was an expletive filled statement that I won’t repeat. 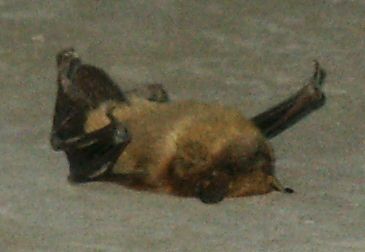 I wasn’t sure if it was alive, but after further inspection (with the broom from kitchen) I saw that this bat was ice cold. So you know what I decided to do after that right… grab the digital camera from the bedroom and take a few pics. Okay so I’m a lil’ bit camera happy at times. But I couldn’t pass up the opportunity to get a close-up shot of this ugly creature. This joker looked like a small mouse with sharp wings and jagged teeth. Although I knew it was dead, I was still a lil’ bit cautious just in case this gremlin decided to wake-up from a comatose state. Ya know, I get tired of being in DC ere’ weekend. So I figured I’d take a trip to see my Celtics play against the Indiana Pacers. First things first, I had to figure out whether I could get tickets. Surprisingly, I have able to get a number of good seats in the club level. Once I got that all taken care of, I had to figure out if I could get a reasonable roundtrip from DC to Indianapolis without spending over $200. Well, being that I’m a frequent flier on Northwest airlines, they owed me a free roundtrip and I decided to use it for this particular trip. I packed my bags and I was outta this joint. Arrived at Conseco Fieldhouse about 30 minutes before the game started. The first person that I was when I walked into the building was Indianapolis Colts head coach Tony Dungy. He was standing in the will-call line with who looked to be his son. A lotta folks were walkin’ over to him, so I decided not to say anything or take a pic. I walked around the foyer of the arena and took a few pics. That place was really nice!!!! They had a lotta different things to do at that arena. It definitely was one of the best stadiums that I’ve ever been to. Ya know I had my Celtics gear on and the big mascot for the Pacers tried to attack me before I even got to the turnstile. I heard the mumbling of folks around me, but I wasn’t intimidated. Those folks had no idea that I’m a professional antagonist. I’m a Cowboys fans and I walk into the den of lions each time I go to FedEx Field for a Redskins-Cowboys game. I have no fear, plus I had my lucky Celtics basketball shorts on underneath my jeans and I was feelin’ good vibes. Yeah, Antoine Walker had got suspended for the game, but I knew that my squad was gonna represent. Paul Pierce was in that joint droppin’ bombs on em. They did more than represent, they crushed those suckaz. They totally destroyed the Pacers. You wanna talk about a happy brotha… oh yeah I was all smiles after the game was over. My Celts beat em down 110-79. Here’s a few pics that I took from the game.